The galleries of portrait photography by Maui Island Portraits showcases families, couples and weddings and individuals, in various environmental settings which are the most popular locations used. 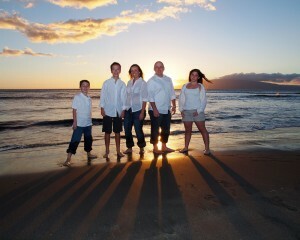 Most of the galleries show beach scenes as Maui Island Portraits specializes in using some of the most gorgeous settings on Maui, which are usually the world class beaches, at sunset. There are several premier beaches to choose from for a photo shoot activity, and Maui Island Portraits abides by the local regulations and permit procedures to ensure compliance. Take a look at the various locations available to you, and get an idea of the style of environmental portrait photography we do. Click the image-link for the gallery category you would like to view, each of which features samples from different photo shoot activities and locations. Each gallery samples some images from one photo shoot, showing the subject(s) in specific, identified, locations. As you view the galleries, you will get an idea of the various locations available to you for your own Maui family photography or Maui wedding photography – for your own Maui portrait photography photo shoot activity. Some of the more common locations, within Maui Island Portraits normal service area, are: Kamaole III Beach Park, Launiupoko Beach Park, Kealia Coastal Reserve, Polo Beach, Wailea Beach, Ulua Beach, Mokapu Beach, Maui Tropical Plantation and Iao Valley State Park. Other available, though less used locations, are: Makena Cove (aka wedding beach – a very small cove often crowded), Secret Beach, D T Fleming Beach, Olowalu, Napili and Kapalua.